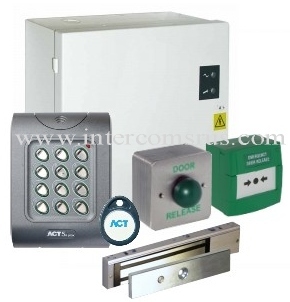 The ACT 5 Coded Kit with Release comprises of : 1 x ACT5 Digital Coded Keypad (12v ac/dc 10 code IP67), 1 x AC Power Supply and 1 x Rim / Mortice Door Release. The ACT 5 PROX AC release Kit comprises of : 1 x ACT5 PROXIMITY Unit (12v ac/dc 50 code-50 Fob capability IP67), 10 x Fob Pack, 1 x AC Power Supply and 1 x Rim / Mortice Door Release. 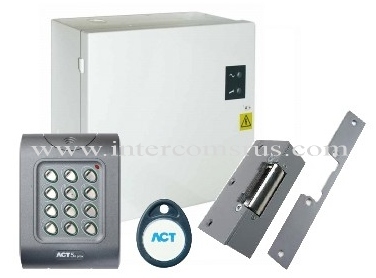 The ACT 5 PROXIMITY MAGNET Kit comprises of : 1 x ACT5 PROXIMITY Unit (12v ac/dc 50 code-50 Fob capability IP67), 10 x Fob Pack, 1 x DC Power Supply, 1 x Slim Line Magnet, 1 x Break Glass, 1 x Exit Switch.